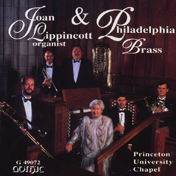 Acclaimed organist Joan Lippincott joins Philadelphia Brass for a wonderfully varied and sonically stunning program of works both familiar and unknown for this powerful combination. The performers find all the elegance and delicacy required by Campra’s jewel-like dances, but they can also pull out all the stops for music by Dupré, Gigout and Widor. Released on the Gothic label. Copyright © The Philadelphia Brass. All rights reserved. Design and Hosting by Whiteboard Media. Professional photos by Hub Wilson.